Conventional techniques for marketing technology products fail primarily because marketers do not truly understand their customers. Do you know what customers really think about your technology? Now, drawing on their award-winning research and case studies ranging from America Online to the Discovery Channel, marketing experts A. Parasuraman and Charles L. Colby demonstrate how the adoption of technology is influenced by unique beliefs that do not apply to conventional products and services. In the context of a general set of powerful techno-marketing strategies, Parasuraman and Colby introduce "Technology Readiness" (TR), a groundbreaking concept that enables you to measure and assess a customer's predisposition to adopt new technologies. Employing their TR construct -- a psychological amalgam of fears, hopes, desires, and frustrations about technology -- the authors identify five types of technology customers: the highly optimistic and innovative "Explorers," the innovative yet cautious "Pioneers," the uncertain "Skeptics" who need the benefits of technology proved, the insecure "Paranoids," and the resistant "Laggards." Using this typology, you can customize your technology strategies by combining insights from your context-specific assessments with general marketing strategies presented in the book. Essential reading in technology companies will be the chapter devoted to Parasuraman's Pyramid Model, which explains the critical role technology plays in a marketing organization as a link between employees, the organization, and the customer. 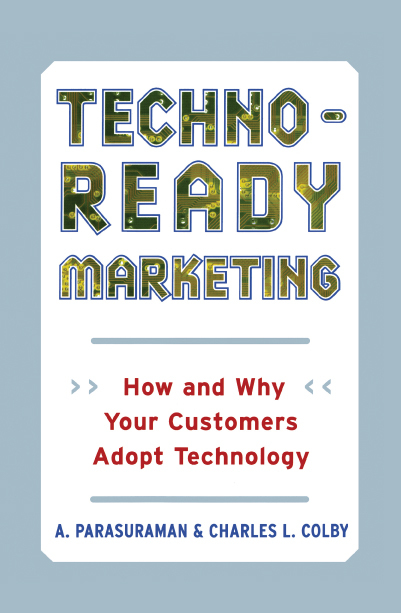 Finally, the authors have included a self-administered quiz so you can score your own Technology Readiness and a chapter on the "Techno-Ready Marketing Audit" to provide a framework for taking immediate action based on the precepts in this book.